If I’m on my way home from the gym or if Nina’s is feeling a little too genteel, I love to grab a seat at Dunn Brothers on Grand near St. Thomas. It has a great vibe and is probably the most social coffee shop in the area. Aside from the main counter, there is also a designated bean counter and cashier in the back of the store who packages up fresh pounds of coffee at your command. In the two hours I spent reading, about 15 people stopped to ask what was fresh and to buy a couple pounds. With the good selection, freshness, and the counter rapport, it feels like a place where the cognoscenti go to buy their beans. Next door is another of my favorites, Breadsmith, close to my heart because it is a Milwaukee company. Even though Great Harvest is walking distance from where I live, I don’t like the doughy, undercooked taste of their loaves. Breadsmith, however, has it in spades, with toothy loaf of whole grain that I wouldn’t exactly call humble. It’s as wide as a dinner plate and, when you cut it open, springs up like a jack in a box ready to show off its perfect texture. To make it even better, it has a price tag of just 4 dollars. 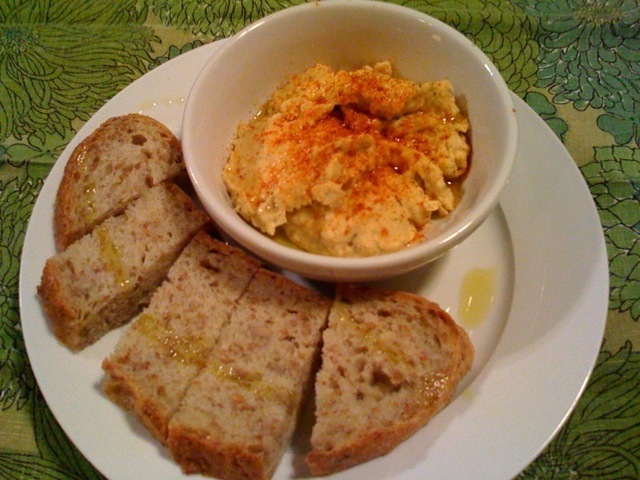 Inspired by the bread, I suppose, I made some of the most satisfying hummus I’ve ever had. I guess there was nothing unusual about it. Maybe I just brought all the usual variations together in the most effective way. The ingredients are large can of chickpeas, 2 tablespoons of tahini, the juice of one lemon, a few glugs of olive oil, two plump cloves of garlic, salt, cayenne, and dry basil, for fun. My two preferred tricks in hummus-making are to first boil the chickpeas until they are warm. It’s not that the beans need to be cooked. It’s that putting warm beans in the food processor along with all the other ingredients heats everything just so and brings out the life of the party. Second, I save about a half cup of the cooking water (maybe less) to add to the hummus as it processes, which ensures a nice, creamy texture. Et voilà, a couple of drizzles of arbequina olive oil and paprika pulls it all together in the end. This entry was posted in Around Town, St Paul Restaurant Reviews, Things I Make on December 14, 2008 by Carrie. Liz – You’ve given me two new things to try, especially this chocolate babka. Breadsmith has SO many good things. I bet GH makes a great cookie, too. Now I have a good excuse to go get some. Maybe for the drive home this week.